The Crater Lake Trail at the Maroon Bells demands that one spend quite a lot of time looking down at their feet. The 1.8-mile trail eventually becomes relentlessly rocky, passing through talus fields and rockslide remnants that require careful footwork of even the more experienced hikers. 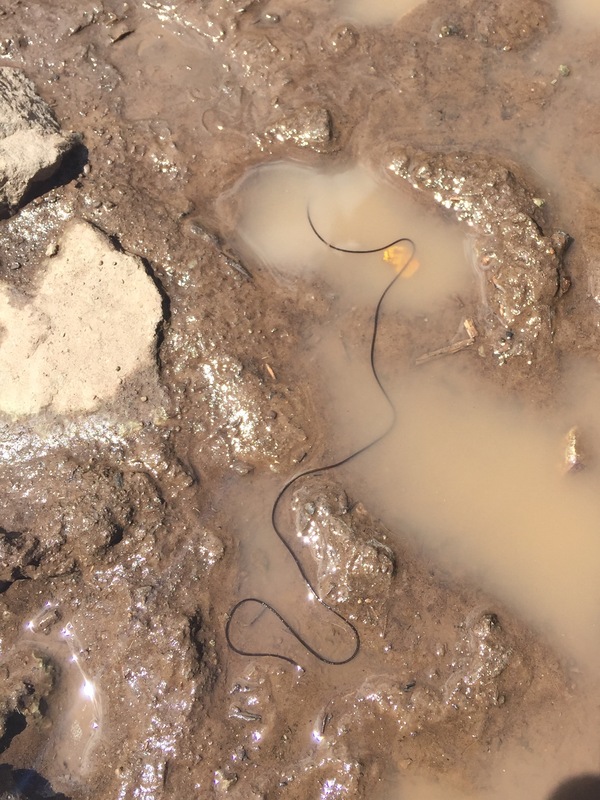 After an afternoon rain, I found myself paying particular attention where I was stepping, and in the process of avoiding slippery outcrops, I noticed what looked to be a stray piece of string or an abandoned shoelace in a puddled footprint. When I reached down to pick it up, it started moving. The skinny, black, worm-like creature seemed to be about sixteen inches in length, but it didn’t spend much time fully extended. It writhed and wriggled around, curling in on itself before thrashing out in the opposite direction. I had never seen anything like this before; my tour guests joined me in observing it, mildly disgusted. The active, spaghetti-like creature, it turns out, was in fact a worm: a horsehair worm, to be exact, otherwise known as Nematomorpha. The horsehair worm is a parasitic species that spends most of its adult life in the body cavity of a cricket. The worm eventually convinces the cricket-- an insect that typically avoids open water-- to jump into a pond, puddle, or feeding trough (hence the name “horsehair”), where it bursts out of a hole its bored in the cricket’s exoskeleton. The female adult worm, which averages at about twelve inches in length, then mates and lays up to 15 million eggs before flattening out, shrivelling up and dying. The larvae that eventually hatch sink to the bottom of the body of water, where they wait to be consumed by the water-dwelling larvae of insects such as mosquitoes or mayflies. As these mosquitoes or mayflies metamorphose and leave the water, they often find death at the hands of a hungry cricket, who unknowingly ingests the hairworm larvae along with their freshly-winged snack. From here it’s all downhill for the cricket, as the horsehair worm larvae bores out of its stomach and into its body cavity, where it remains throughout maturation, soaking in nutrients through its skin and weakening its host. Eventually-- and this is where entomologists remain baffled-- the worm somehow signals to the cricket that the insect should jump into the nearest water source, where the now fully grown worm may make its great escape so that the process may start all over again. While it’s easy to be grossed out by this wriggly creature, or to think oneself better than this parasitic monster that lives inside, mind-controls, and then kills its unsuspecting host, it might be worth taking a moment to respect the incredible feat of evolution and survival this worm represents. The Rockies are a conglomerate of extreme micro-habitats, each beckoning species to adapt and figure out how to take advantage of all it has to offer. Perhaps no habitat is more extreme than the body cavity of a cricket.